Hello! Come on in and have look around. Today I have a tasty appetizer recipe to share with you. Truth be told - I even make these for dinner! They are easy to make a require very few ingredients - give them a try! "The potato, like man, was not meant to dwell alone." 2.) Place potatoes in a pot with enough water to cover them. 3.) Cook on medium-high, until they are almost tender. 5.) When the potatoes are cool enough to handle, cut off ends and discard. 6.) Cut each potato in half. 7.) Using 1/4 tsp measure spoon or a melon baller, scoop out potato, leaving a 1/4-inch shell. 9.) Combine reserved potato and blue cheese in medium bowl. 10.) Mix well to blend. 11.) Add in 3/4 off diced bacon and combine. 12.) Season to taste with salt and pepper. 13.) 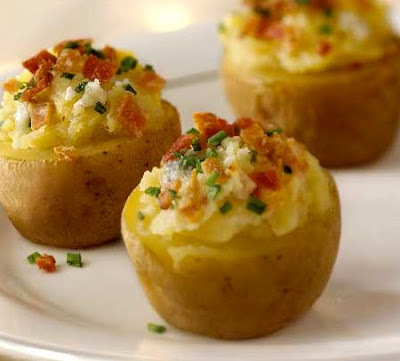 Scoop mixture into potato shells. 14.) Sprinkle with the remainder of the diced bacon. 15.) Place potatoes on a baking sheet and cook 7-10 min, until hot. 16.) Put potatoes on a serving platter and garnish with chives. "Zen...does not confuse spirituality with thinking about God while one is peeling potatoes. Zen spirituality is just to peel the potatoes." ...Anything, just butter him up. those look yummy ... & i'm kinda hungry so if you wouldn't mind stopping by with some for dinner please!